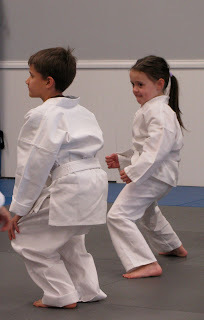 If you are a regular reader of this blog or my facebook page, you know that our 8 year old daughter, Morgan, is currently a blue belt in Tae KwonDo. I've enjoyed every minute of watching her progression up the ranks, and putting all parental bias aside, I happen to think she's very good and will be a black belt before we know it. Our son, Tristan, has been watching too. And however much Morgan annoys him on a daily basis, he's proud of his little sister. He's the first to cheer her on and encourage her through learning difficult techniques. Well, yesterday he finally decided he wanted to give it a try for himself. He's not really a very athletic kind of guy, preferring the sports of hunting and fishing to football and baseball. But he's excited. 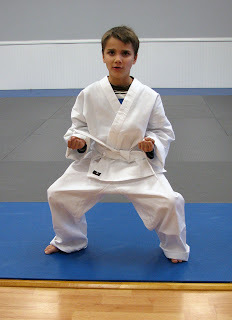 He came away from the first lesson enthused about his own performance and ready to begin his own journey to black belt. And what's this? Another new student already checking out his moves? Awesome. Looks like we're going to have a couple of martial arts superstars around here. The pics are so cute! I have to congratulate you....I have only seen two pictures of Tristan, counting this one, that he actually smiled well. LOL Great job! Is this considered cruelty to animals?